I had request for cupcakes this weekend. They had to be good for breakfast (muffins) and have banana in them. I didn’t want to make a muffin, so I stuck with a cupcake recipe and planned to go light on the frosting. I made two attempts (two full attempts, but a total of three different recipes) and I am not 100% happy with any of them. I will print the best of the recipe bases, but the base recipe needs work. The cupcakes tasted yummy, but the texture was too dense, hence why it needs work. I made a few flavor combinations – toasted pecan and cinnamon, macadamia nut and white chocolate, and pistachio and cardamom. I don’t have many pictures as I had a guest over while I was baking. 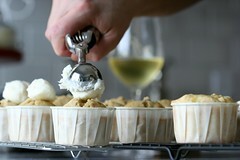 My guest was a fellow baking enthusiast who I met through the blog. She is a caterer and cooking instructor in the bay area. She is mid-remodel and wanted to see what I had done. She brought delicious Vietnamese sandwiches. It was great to share tips. I am going to try some out in the weeks to come. They look great. I’d have loved to see the inside. Have you tried Rose Levy Beranbaum’s Sour Cream Banana cake from her book The Cake Bible? It is a great cake, and I bet it would make tasty cupcakes. The cake is not too dense or mushy, with a good banana taste, and not overly sweet. btw–I love your blog. It is so inspiring. Thank you both for the great tips. I didn’t have much time to research this weekend and I think it shows :) Next time I try anything banana I will track down these two references. Thanks! I, too, made a banana-based cupcake-muffin this weekend — based on the Hummingbird cake. I like the look of your caramelized banana to top them off — how do you make yours? Yum–those flavor combinations sound great. Last week I tried my first from-scratch cupcake baking, after being so inspired by your blog (and all the luscious photos at Cupcakestakethecake). Mine were banana with chopped pecans (some w/o nuts)with your FABULOUS chocolate ganache frosting recipe. The cupcakes were a bit too dense, but they stayed moist for days. And that frosting, oh, that frosting– soooo good. Beautiful – I agree with the RLB banana cake suggestion. I recently made a banana-tamarind cake with a peanut butter caramel glaze based on the Cake Bible sour cream banana cake. I could not believe how light and fluffy it was. All the banana flavor without its characteristic density. I used cream fraiche instead of s.c., and I bet you could use buttermilk as well as your favorite flavor combo. It is her method that is so unique and cake flour really lightens things up well. BTW, I love your blog. This past week I made cupcakes for a friends birthday inspired by your fudge frosting. (The rasberry-topped cupcakes on the vintage red stand). I was short about a cup of powdered sugar so I cut back equally on the milk. It ROCKED! I used the same chocolate ratio as your recipe. They were a big hit. Wow…what kind of fillings are in Vietnamese sandwiches? They eat sandwiches in Vietnam?! New food to try! I’ve never made banana cupcakes, only muffins (my favourite being a white chocolate, walnut and banana recipe. More generally, it’s a good site about Vietnamese street food in general. Heh sorry ‘anonymous’ didn’t mean to sound patronising! When I think of Vietnamese food I automatically think of the Asian cuisines I actually know a little about – Chinese, Thai, Korean – and these seem to be based on rice, bread not being much eaten at all. So it seemed a whole new concept to me. Thanks for the link, I’ll get reading. Your blog has revolutionized my baking! 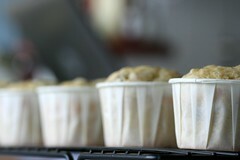 I am a muffin girl who has never cared much for cupcakes — all that icing, the part of cake I least enjoy…. But your style of filling the cupcakes — I love a baking surprise. So I have adapted your technique to my muffins — my family kisses your internet toes. So far I have a 5-Spice streusel banana muffin (or sweet potato — yum) and a pineapple coconut muffin. Both are topped with streusel plus contain a surprise filling of the same. Wonderful — the inner streusel stays moist and spicy in contrast to the crunchier topping, plus it helps keep the muffin moist. Next its going to be an apple filled muffin — I am branching out to a different filling from the topping. Baking is too much fun! Hi, suzyny – I just heated up a non stick pan, threw a small amount of butter in there (half tablespoon) and placed the little banana disks in the pan. I let them slowly caramelize on one side over medium heat. After they are browned, I flip them carefully with a couple of forks. Hi, chochotte. Seems that the definition of a muffin has changed over the years. For example, the chocolate cream cheese muffins are really like cupcakes without frosting. I look at the carrot cupcake/muffin as a good guide — if it has no frosting or just a smear of frosting its a muffin. If it has a lot of frosting, its a cupcake. In my book anyway! Hi, Phoebe… In this case it was a Sauvignon Blanc that did the trick. I got a bit tipsy, actually! Michele, that’s exciting to hear. Your recipes sound awesome. You should share them, too! Those look scrumptious! Chockylit, your cupcakes look so yummy :) I did want to ask you a question, do you use a scoop (ice cream spring handle) to put batter into the pans? If so, do you know what size you use? I’ve been wanting to buy one, but I find that local shops either carry really big ones or really small ones, and there are so many online, who knows which one to choose. Just wanted to get your input, thanks! We recently tested 4 different recipes when trying to make a chocolate cupcake that was not too heavy but not too light. (We won’t be eating any more chocolate cupcakes for quite some time!) 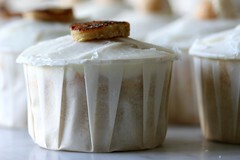 Hope you find your ‘just right’ banana cupcake recipe soon. I made them with just the cinnamon and toasted pecan addition. I was skeptical about the oil (don’t know why), but they turned out amazing. I baked with convection though to see, and they were a *bit* dry but also not too dense — nice and cakey. I also used a bit less sugar and certainly made up for it with that amazing frosting. I added cinnamon to the frosting as well, which was nice! I just made these with a few modifications due to ingredient availability (I live in Spain). I also took Leecb’s advice on adding baking soda which worked. They didn’t come out dense, but not light either. I use natural yogurt instead of buttermilk and instead of white sugar I tried brown sugar. The fillings that worked for me were white chocolate chunks with chopped walnuts (hard to find macadamia nuts here) and chopped toasted pecans with a chunk of chocolate that I placed just below the batter in the filled cup. My husband absolutely loves them! Thanks for the great ideas and wonderful combinations of flavors! 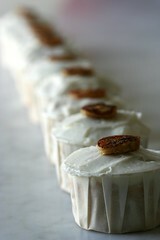 i need to make 100 banana cupcakes for cheo any recipes that make that many? I’m having problems with my cupcakes. It tends to dome off center. What am I doing wrong? PS love your blog. If they are not centered then you likely have an uneven floor/oven or the temperature in the oven is uneven.